Not all that long ago, we had a water deficit, then we got back into water surplus in a bit of a hurry and now there’s a bloody big mess and somebody’s got to pay for the cleaning up. Now, we could whack on a flood levy, or “great big new tax” if you’re the excitable type, though one of the chaps from the Reserve Bank Board reckons that’s a bad idea on the grounds that the economy’s already a bit damp around the ankles (might make them drop interest rates though). Otherwise, you could, as an excitable type has suggested, stop building the NBN to pay for it, though you don’t need to be on the Board of the Reserve Bank to work out that’s a pretty stupid idea. 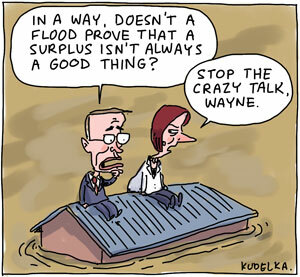 Now I’m Â not a leader of either of Australia’s major political parties, or in fact an economist, but in the spirit of The Third Way, perhaps just waiting a bit longer before Wayne’s able to leave the red pen in the pocket protector when he’s finishing up the bottom line of the budget might be a better way to go. I’m all for saving up for a rainy day, but not when the rainy day’s just happened.